A perfect storm of outside forces pushed the stock lower in September. What's next? What: Shares of Netflix (NASDAQ:NFLX) fell 10.2% in September, according to data from S&P Capital IQ. The stock has still more than doubled in 2015, but also trades nearly 18% below the all-time highs it set as recently as early August. So what: At the start of September, Netflix saw a flurry of digital video moves from a plethora of major rivals. Hulu started an ad-free premium service with a premium monthly price tag. Amazon.com gave its Prime Video subscribers the option of downloading video files for later consumption -- a move Netflix CEO Reed Hastings has sworn off entirely. Finally, the rumor mill churned out reports that Apple would finally dip its ginormous toes into the subscription video service market with a Netflix-style service all its own. It didn't help that Netflix let a long-standing content relationship expire at the end of the month, or that the markets in general suffered from from jitters about the situation in China. When everything is under the economic gun, highfliers like Netflix often sink faster than the rest. Call it a perfect storm, if you will. It's almost a wonder that Netflix shares didn't fall a lot further than 10% in September. Now what: OK, so the Apple service didn't come to pass in September, though the rumors never quite subsided. That albatross might haunt Netflix for a while, until Cupertino either finally makes its move or shoots the speculation down with authority. Other services, from Hulu to Amazon Prime and beyond, will continue to pose significant threats to the Netflix model. However, none of them are expanding overseas with the confident authority Netflix is showing. They also fail to match Netflix's market-defining popularity in the crucial domestic market. In other words, the competitive landscape is much as it always was: mottled, potentially brutal, and not currently killing Netflix. In fact, Netflix's rivals are probably more numerous than you think. In a conference held mid-month, Hastings reminded investors that Netflix actually competes with "everything you do to relax." That widens the field quite a bit. "We compete with video gaming, we compete with drinking a bottle of wine -- that's a tough one!" Hastings said. "We compete with other video networks, with playing board games. ... Think of any night you did not watch Netflix. That, what you did, that was the competition!" So, Netflix knows that it's up against a tough slate of rivals. September didn't really change that. 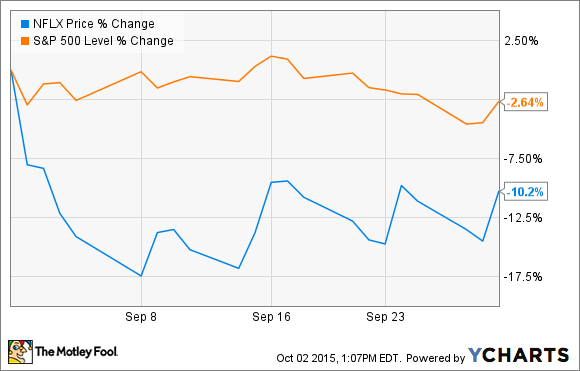 At the start of the month, I said September would be a great time to buy Netflix shares. That recommendation still holds, just with an even greater discount. That picture might change in a couple of weeks, when Netflix reports its third-quarter results. But for now, it's still a great company trading at a seemingly temporary discount.